The Concerned Citizens for Atiku, (CC4A), Friday paid a courtesy visit to the former Vice President of Nigeria, Alhaji Atiku Abubakar, at his media office in Jabi, Abuja, where we urged him to speedily declare his intention to run for office in the 2019 presidential election. We were received by the Turakin Adamawa’s media aide and leader of the Atiku Media Office, Mr. Paul Ibe, and his deputy, Alhaji Sani. Convener of the group, Adebowale Jante, addressing the press and Mr. Ibe, noted that Nigeria is in dire need for a competent leader like Alhaji Atiku Abubakar. “Your Excellency, it is an honour and privilege to stand before you not just as a group of patriotic young people of like minds, but also as citizens under the umbrella of Concerned Citizens for Atiku (CC4Atiku) whose common interest is not limited to the total reversal of the unfortunate under-development of Nigeria, but also ensuring her speedy climb, up the ladder of economic growth and prosperity, as well as the wellbeing of its citizens irrespective of all sentiments. “The formation of this progressive pressure group, which has Coordinators in the 36 States of the Federation as well as in the diaspora, was borne out of the need to create a platform for sustained dialogue towards finding better alternatives for resolving many of the multi-faceted challenges facing our beloved country, Nigeria. “No doubt, our country is at a crossroads and urgently needs rescue. Nigeria is in dire need of a leader with a track-record of credibility and empathy, a leader with vast political and administrative experience, a focused and detribalised leader with friends across our geopolitical borders, a leader with memorable antecedents and a man of unquestionable character” Jante said. He went on to explain that the group had turned down the opportunity to appeal to the former vice President, and had resorted to compel him, warning that posterity will demand answers from him should Nigeria continue along this treacherous path of socio-economic decay. “For us in this group, having decided that you are the only man who can rescue this nation, our involvement has gone beyond appealing to your good self. We see this project as a mission of compulsion, a commitment to dragging you into the 2019 presidential race as an urgent and necessary step to save this country from an imminent catastrophe. In his response, a visibly excited Paul Ibe stressed that the visit by CC4Atiku was one of hope, especially in the light of Nigeria’s current level of poor governance. 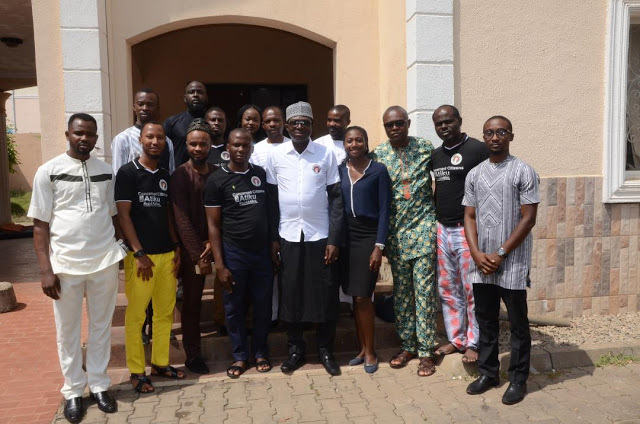 He commended the group for its make-up, alerting that it was a step in the right direction for young Nigerians to be actively involved in politics at all levels. He noted that the CC4Atiku visit and its intentions are in tandem with the #NotTooYoungToRun campaign and encouraged the members of the group to not relent in their efforts. “The beauty of this group is its constitution of young people who are not sitting back and expecting things to be handed to them. “Your visit has given us hope, hope that indeed our situation isn’t irredeemable, and for that we thank you. “Your visit and intentions lend much credence to the #NotTooYoungToRun campaign, if you must run, you must be able to rally together and that is what you have done today, and I’m truly impressed with you. “I assure you that Turakin Adamawa will receive your message before Juma’a time today” Ibe said. After the address, Jante presented Mr. Ibe with souvenirs for himself and Alhaji Atiku Abubakar.